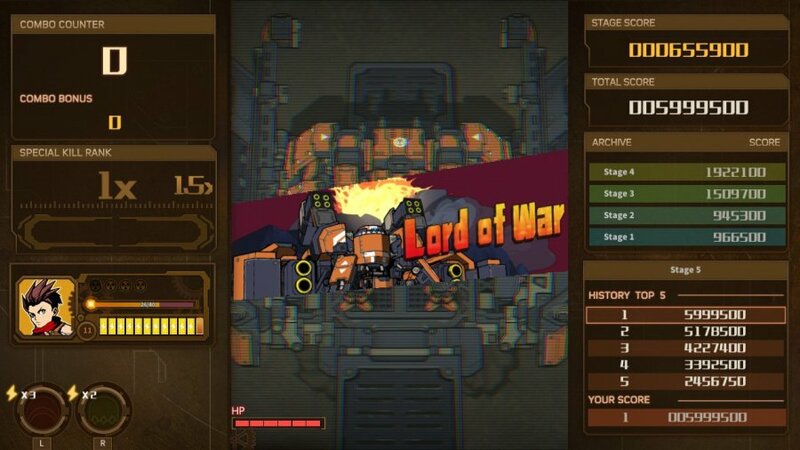 The ability to undock the Switch Joy-Con and play the console in 'portrait' or 'TATE' mode has gifted Nintendo fans with some truly excellent shooters since the console launched in 2017; we've already seen the likes of Ikaruga, Strikers 1945, Psyvariar Delta and Gunbird 2, all of which can be played in portrait orientation, giving a much better view of the on-screen action. 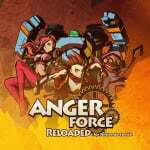 That positive trend continues with AngerForce: Reloaded, a vertically-scrolling blaster which – while not based on a classic arcade property – sits comfortably alongside those aforementioned genre greats. 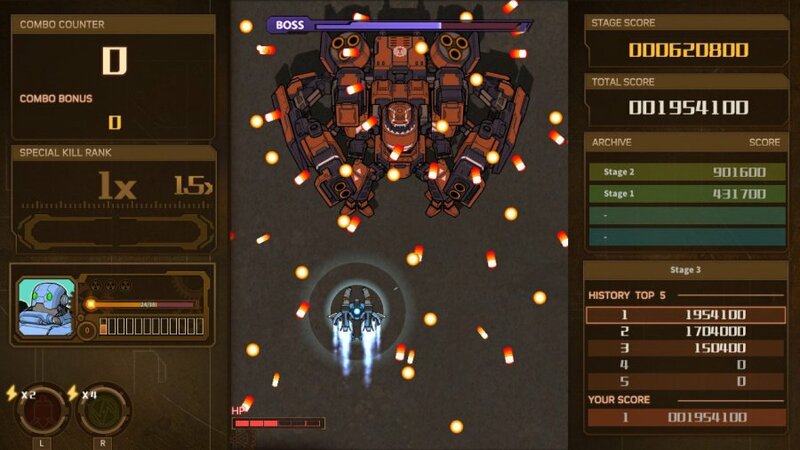 Set in an alternative 19th century where machines are rebelling against their human creators, AngerForce: Reloaded appears to be a fairly conservative shmup at first glance, and one that takes more than a little inspiration from the likes of Psikyo's Gunbird franchise. This is a world of automated monsters stalking through the dusty streets of Wild-West towns and Arabian bazaars; while the fusion of old and new isn't exactly innovative, it's so well done that AngerForce avoids the usual 'spaceship versus aliens' scenario that so many shooters lazily fall back on. This inventiveness extends to the gameplay, which is presented in two main modes. Arcade is pretty self-explanatory; you select one of four characters – each of which is blessed with different attributes and special attacks – and try to make it to the end of the game's seven stages. You only get a single life but can take multiple hits, and in-between levels you have the chance to select from a series of randomly-generated upgrades which enhance your shot power, increase your health or allow you to absorb enemy bullets with certain special attacks. Like the end-of-level enhancements in Downwell, these are different during each run, which adds a nice degree of unpredictability to what would otherwise be a fairly standard mode. The 'Y' button discharges your standard shot, and can be held down for a rapid-fire effect. 'A', on the other hand, fires a single standard shot and then initiates an energy charging cycle when held down; energy is used to unleash one of your two special attacks, mapped to L and R buttons. Killing enemies with special attacks earns you a score bonus, as well as the chance to start a combo which can earn you big points. Collecting purple icons from fallen foes also recharges your energy and is a more effective way of keeping it topped up, as holding down 'A' to recharge leaves you exposed to enemy fire. As you use your special attacks and collect items you fill up a secondary meter which, once complete, grants you an extra smart bomb. These are deployed with the 'B' button, and each character has their own unique screen-clearing bomb effect. In addition to all of this, you can use the 'ZR' trigger to speed up your character; while it's held down, they'll move faster than normal, which is handy for getting out of tight spots. When you require pinpoint precision, you can hold down the 'ZL' trigger to slow your character down, making it easier to weave in and out of the game's increasingly complex bullet patterns. 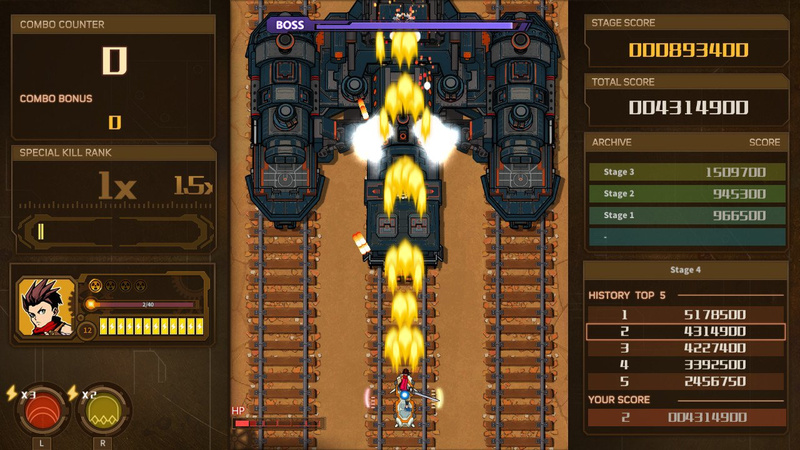 While the rigid definition of a 'bullet hell' shooter might be too strict to include AngerForce: Reloaded, there are certain times during the later levels where avoiding the seemingly endless waves of projectiles truly tests your reactions; getting to the end of the Arcade mode is a real triumph in itself, but it's the game's superb Campaign mode – which can also be played in local co-op with a friend – which will really keep you occupied. Here, you once again select your starting character, but you can only access the 'Noob' mode initially; this is three levels long, and, once completed, allows you to play the 'Normal' mode. Comprised of five levels, this ramps up the difficulty by giving each boss an 'enraged' mode, making them harder to defeat. Once Normal mode has been bested, 'Veteran' opens up; this offers the full seven levels seen in the Arcade mode, but showcases faster bullets which come in much denser patterns. 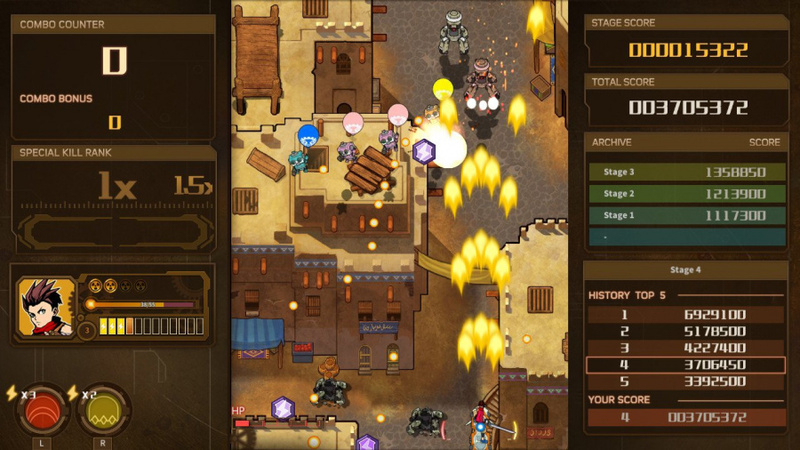 You begin with weak attributes, but collecting special glowing orbs will give you points that can be spent either in-between missions (to replenish your stock of bombs or reclaim lost health) or at the end of a game; a host of 'general' upgrades – which apply to all four characters – become available at this point, and these increase your shot power, health and bomb stock. You can also purchase other special upgrades, such as the ability to avoid taking damage when you collide with enemies, or a shield that appears briefly when you get hit, protecting you for further damage for a few precious seconds. Some of these abilities can be powered-up more than once, and each character has their own unique set of upgrades to unlock. These enhancements are persistent and carry over between sessions, giving you a better chance of success in your next game. It's the same kind of trick Treasure pulled with the domestic port of Radiant Silvergun, which had weapons that became more powerful the more you played, and it's just as effective in maintaining your interest here. It might initially feel like this system places too much emphasis on grinding to increase the stats of your character and give yourself a better chance of beating the 'Veteran' mode, but that's not the case; by cleverly locking away levels on the two lower difficulty settings, the developer is encouraging you to increase your powers (not to mention your skill level) in order to see the end; it's also worth noting that you can earn quite a few upgrade points by simply playing the first two levels over and over. It's also worth pointing out that a large number of upgrade points can be used as Continues for when you lose all of your energy. 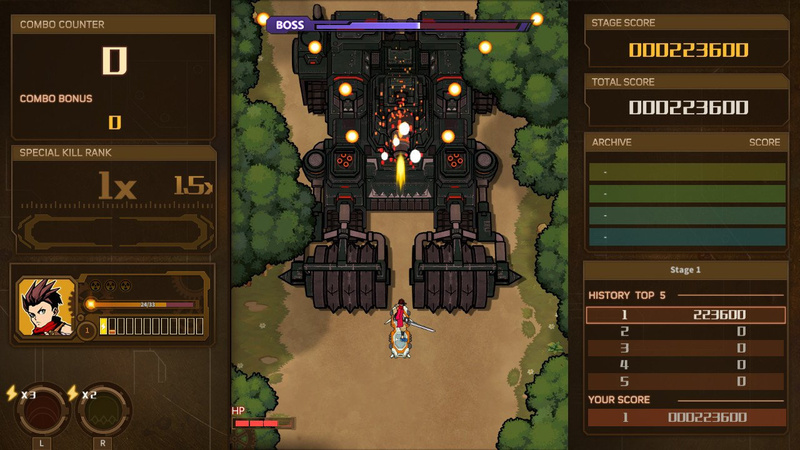 The clever structure of the Campaign mode means AngerForce: Reloaded's longevity goes way beyond what you'd normally expect from this kind of game, but even without it, the deep and nuanced nature of the gameplay – more specifically, the interesting scoring system which rewards you for using your risky special attacks up-close in order to build up combos – would be enough to maintain interest. The delicate balance between maintaining your energy level and diving in so you're close enough to use your special attack to take out multiple enemies means this is far from your typical 'mash the fire button' shmup; tactical thinking is often as important as quick reactions. AngerForce: Reloaded scores highly when it comes to presentation, too; for the most part, it looks and sounds fantastic. The music is perfect, with some cool guitar riffs and atmospheric tunes; the rest of the audio package is equally impressive, thanks to some particularly fullsome explosions and other sound effects. While purists might take issue with the super-clean HD visuals and lack of blocky pixels, the design of the enemies and bosses is stunning. The visuals are a curious mix of 3D and 2D; according to the developer, the game's graphics have been created using "traditional 2D technology combined with a free-form deformation technique" which helps to achieve "a unique 3D-like effect". In short, everything in the game looks like it's being rendered in 3D, but they're actually 2D sprites. The boss transformations, in particular, are absolutely wonderful, boasting silky-smooth animations that give these screen-filling enemies real weight and scope. Backgrounds are equally striking, containing a staggering amount of incidental detail. 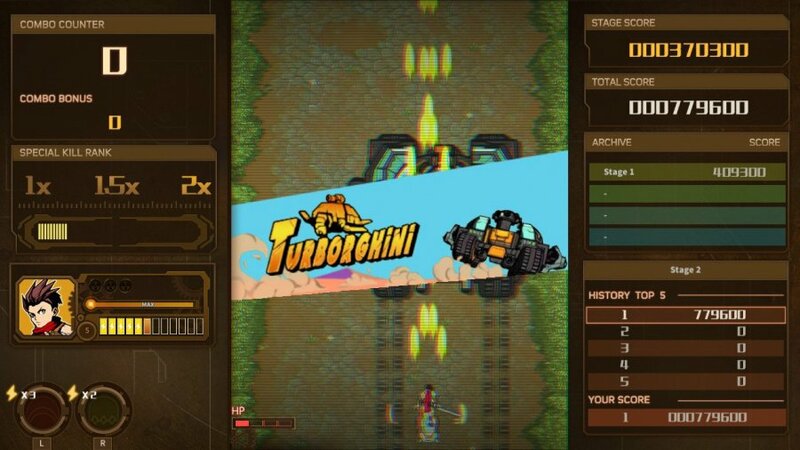 Some of the levels dash by so quickly it's hard to fully appreciate them when you're frantically trying to dodge bullets, but the slower-scrolling stages really show off the talent of the artists behind this title. It's a shame then that the story sequences that play out during the Campaign mode look so amateurish and unfinished in comparison; another minor point is the fact that the English translation is less than perfect and some passages of text are slightly difficult to parse. Load times are also longer than we'd like. Like all good vertical shooters, AngerForce: Reloaded has a mode which allows you to rotate the display 90 degrees, meaning you get the full impact of those amazing visuals. Combine this with the essential Flip Grip accessory, and you've got the ultimate way to experience this fine shooter. Our only complaint here is that while the gameplay is displayed in portrait, the menus remain in landscape, so you have to rotate the Switch back to its 'normal' orientation and try to get your head around the fact that the controls are the wrong way around. Another niggle is that you have to enable portrait mode every single time you start a new game. While it lacks the arcade pedigree that makes other Switch-based shmups so popular, AngerForce: Reloaded has clearly been put together by a team that understands what makes this long-established genre so appealing. It offers tight gameplay, fantastic visuals and a stern challenge, but the addition of a rich Campaign mode – which rewards repeat play via a series of unlockable upgrades and abilities – extends AngerForce: Reloaded's lifespan considerably. Fans of the genre should ignore the lack of a big-name IP and pick this up as soon as possible, while newcomers can be assured that the gently-scaling challenge of the story mode offers a perfect introduction. Will pick up after this review!! Oh wow. I hadnt even looked twice at this, but it sounds right up my alley. I was looking for something light to play. Sold! Yeah, I was also going to skip over this but I'll add it to the list now. Definitely sounds better than I initially thought. On the wish list it goes. I didn't even know you could play the switch in tate mode until now. I've been playing Ikaruga wrong this whole time! Enjoying this so far. However the button mappings are in the wrong place and don't match those described in the Options page (E.g. Under Options, button "A" should be auto fire, but it's set to "Y".) Looks like a bug - anyone else experiencing that? So this runs at 60fps, correct? It sounds like a great shooter. I'm very inclined to go get it! Yes it does run at 60fps. I just watched the MGT YouTube video. They always show like every single Switch release running in handheld mode at up to 1080p 60fps. I love that I can check every game's frame rate that way! Played it last night and each character is very distinct. Really nice mechanic between using using specials for points... vs... charging and not shooting. Very good risk/reward and skill reward system. Nice graphics BTW. @Bunkerneath Thats a solid basis to deny yourself incredible game experiences. Great review. The structure of the campaign, as explained here, reminds be of another great 2D shooter that would be great on the Switch: Jamestown. What's the price of this game? Anyone know which European eshop has the cheapest price? Eshop prices doesn't have the price for this game yet. I got this and, while I really like it, this review misses an absolutely glaring problem that suggests this was reviewed before being finished. Namely the slowdown. It crops up now and then in the early levels, but gets really bad in the later levels and goes through the roof when you meet the final boss. This is not deliberate slowdown either. This is screen freezing, input delaying slowdown that can easily cost you hits. I wouldn't say it's enough to put me off the game at all, but, while it's a very, very decent imitation of a Psikyo shooter with some really neat visuals, it is not at that level and the slowdown is a major issue. The fact it's been missed makes this review basically worthless. Bought the game after reading this review. I love Shmup. I really like how the game is inspired by Psikyo's classics. On a sidenote, the Psikyo Collection Vol. 3 is available for preorder on Play Asia. @PhilKenSebben I'm not THAT big into this type of shooter, but this is likely tied for my favorite of all time. @kobashi100 i think it was 15, i had a $9 credit so i paid a few bucks.